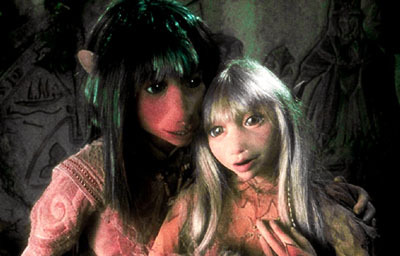 Another World, Another Time...In the Age of Wonder...Two Gelflings, Jen and Kira, must make a Quest to heal the Dark Crystal and save their World from the evil Skeksis, before the three suns join as one. A thousand years ago the Crystal cracked and two new races appeared, the wise Mystics and the evil Skeksis. The Skesis took control over everything, but there was a prophecy that a gelfling would end Skesis Power. So fearing for their lives the Skeksis killed all Gelflings, and now only Jen and Kira survive. So each one, with their own gifts, must help the other. But there are many obstacles ahead of them. One of the most important being the self-centered Skeksis Chamberlain looking for a way to end his exile. Can you prophesy the end of the film, if you think you can, remember, Prophets don’t know everything! So for the answer to this and many other questions I suggest you watch this delightful fantasy from Jim Henson. I didn't catch this film when it was in theatres, but in '83 a girl in my third grade class came to school with a Dark Crystal lunchbox. Needless to say, I was hooked from that moment on. I later traded her something and recieved a few trading cards from the movie. I carried these around for years until I finally saw The Dark Crystal... Today it is still my favorite film, and I know every line. I hope that you will feel the same way. Hopefully this movie will be passed from generation to generation, and will survive the test of time. On that note, I dedicate this review in loving memory to Jim Henson...Who has brought me and many others so much joy. Does it have any? Not in my book.